My son Jaxon wanted a Bakugan party for his 6th birthday. After tossing around a few ideas this Bakugan Birthday Cake was what I came up with. I used the back of the cards for the idea. There are 29 cupcakes in this cake. It helps if you can get all of the cupcakes the same size. I used white icing in the middle, yellow icing around the white and orange icing around the edge. Then I dragged the knife through the three colors to made it look like the burst of light. I photocopied the card to the size I wanted on the cake so it was easier to pipe the words and symbol on. I found a round container the right size for the circle and then just went from there. Then I piped black around the edge. The kids loved it and the parents couldn’t believe that I actually made it. We had the party at the movie theater so after the kids watched Bakugan on the big screen this was a great ending to a great party. Love the idea using the cupcakes like this! My son’s Bakugan party is this coming Sunday (in 3 days) and I love your cake. I have a few questions though. How thick does the icing need to be in order to smear it to blend the colors together? Did you make your own icing. If so, can I have the recipe? Doesn’t the icing fall down between cupcakes and make holes in the design? How long did this take you do do? Sorry if this is too late for the party, I don’t know when the comments were actually posted. I used the buttercream icing recipe from Wilton.It has to be fairly thick to cover the cupcakes maybe 1/2″ then there shouldn’t be any problem with the icing falling. Forgot to look how old this posting is. I love this cake! I really like how you stayed true to the Bakugan image but put your own spin on it. 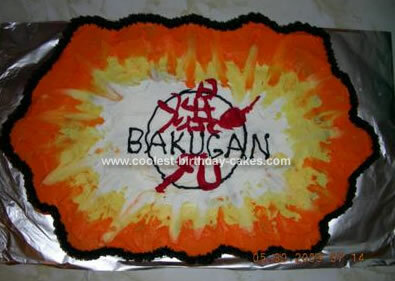 Did you trace the actual Bakugan image on the cake with piping gel (or toothpick) and then rewrite with red buttercream? It looks so good and the cupcake idea was really creative.